We were so happy to check off one more item on our “to do” list: the Big Dipper in Converse, Indiana. When the boys and I are on the road together, you know that we will make any excuse to stop for ice cream. 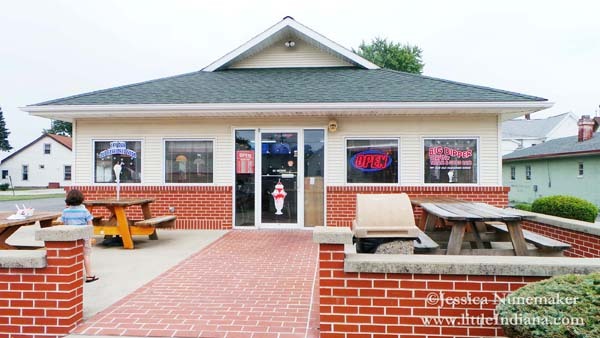 Situated on a corner at the end of town, Big Dipper features indoor and outdoor seating. Outside, enjoy an open patio located at the front of the building with enough seating for groups. Inside, it is so incredibly clean, it shines. There’s a ton of seating here from stools at the old fashioned ice cream counter featuring shakes, malts, and sodas to plenty of tables and chairs. Decked out in the red and black checks of the familiar soft drink, it’s vintage vibe is appealing and fun. 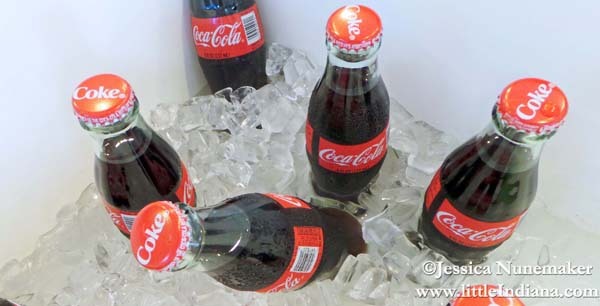 Find old fashioned sodas in flavors like peach, cherry, vanilla, and pineapple. Root beer floats, phosphates like green river or raspberry, and plenty of shakes–including cappuccino. Our decision was actually pretty quick considering the variety. Sundae flavors like S’mores, Peanut Butter Smash, Mud Pie, Turtle Sundae…you get the idea. The boys and I ordered various flavors of hard-pack ice cream. The oldest loves Tiger Strip and got a cone, the youngest found one of his favorites, SuperScoop, a swirl of three flavors including Blue Moon, while I had the Grasshopper Sundae: Mint Chip ice cream, crushed up Oreo cookies, marshmallow, and chocolate. It was pretty–and tasty. We took our snacks outside to enjoy the spacious patio. That’s oh so right, especially if you happen to sit outside. The smell of beef and pork smoking in the outside smoker will make your mouth water. More than barbecue items, there’s broasted fish and chicken, a pork tenderloin sandwich (I wish I could have tried that one! ), and burgers (to name a handful) will make even the most faithful local customer feel like there’s still plenty of options. You won’t find this list on a typical menu, no, Big Dipper possesses large screen TV’s that dominate the walls above the counter and list every delicious entree. 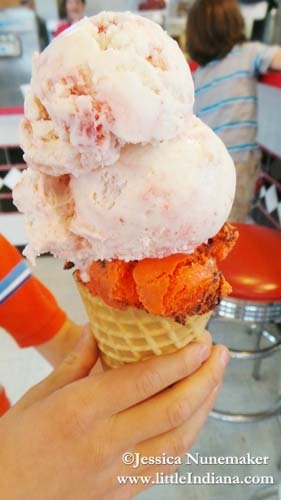 Whether it is for a meal or for a snack, Big Dipper in Converse, Indiana is a great choice! Before leaving, a wall near the counter highlights bits of Converse history like class photos and sporting events. Be sure to check that one out. Need a reminder of the delicious desserts, great lunch or dinner entrees, and want to stay on top of unexpected specials? Then follow the Big Dipper on Facebook.